Cardinal, Archbishop of York, b. at Ipswitch, the usually accepted date, 1471, being probably three or four years too early; d. at Leicester Abbey, 29 Nov, 1530. His father, Robert Wulcy (or Wolsey), was a man of substance, owning property in Ipswich, but it is not known that he was a butcher as commonly reported. The Cardinal himself always wrote his name as "Wulcy". He was unusually intelligent and was sent to Magdalene College of Oxford University at the age of eleven instead of the normal age of fourteen. At the early age of fifteen Wolsey had gained his degree as a Bachelor of Arts, which earnt him the nickname of the 'boy bachelor'. About 1497 he was elected fellow of Magdalen, and after becoming M. A. was appointed master of the adjoining school. The father of three of his pupils, Thomas Grey, 1º Marquis of Dorset, presented him the rectory of Limington in Somerset in Oct, 1500. He had been ordained priest at Marlborough (10 Mar 1498) by the suffragan of the Bishop of Salisbury. He also received other benefices, and became one of the domestic chaplains to Henry Dean, Archbishop of Canterbury. After leaving Oxford Wolsey worked his way up the social ladder with help from the Marquis of Dorset and Henry Deane. After Dean's death (1503) Wolsey entered into the service of Sir Richard Nanfan, deputy lieutenant of Calais, who perceived his remarkable talent for administration. Nanfan recommended Wolsey to the King on his retirement in 1506 and in 1507 Wolsey became a chaplain to Henry VII, and was befriended by the influential Richard Fox, Bishop of Winchester. He shortly acquired the livings of Redgrave in Suffolk (1506) and Lydd in Sussex (1508), and about this time the King began to employ him in the diplomatic service; it was probably then that he made the well- known journey into Flanders and back as special envoy to the Emperor Maximilian with such rapidity that when he returned on the third day the King, believing he had not yet started, rebuked him for remissness. As Master of the Rolls his grasp of practical affairs enabled him to initiate reforms which greatly accelerated the business of the Court. On 2 Feb 1509, he was made dean of Lincoln, and on the accession of Henry VIII, which happened shortly after, he received an assurance of the continuance of royal favour in his appointment as almoner. On Henry VII's death Wolsey stood to lose everything as 'the old king's favourites were not popular in the new reign' but by 1509, with help from Richard Fox, Wolsey secured the deanery of Hereford. Wolsey, about thirty years of age and blessed with energy and confidence, found himself with a new master - an eighteen-year-old King determined to achieve as much glory and renown as possible. From here on the rise of Wolsey must have been wanted by Henry VIII. This is indicated by the actions of the other members of the council. On 26 May 1511 Wolsey presented Warham with a bill signed by the King but which lacked the authentication of both signet and privy seal and yet the chancellor accepted it because 'Dominus Wulcy' gave him the letters by the King's direct command. It suggests that the King did trust Wolsey, even from an early stage and that those close to the King recognised this too. It would seem then that the increased speed of Wolsey's rise was not coincidental and was manufactured by Henry himself. It would be illogical to say that Wolsey's rapid rise to power from the lowest depths proves that Henry VIII had complete trust in him. Henry was merely following the policy implemented by his father of choosing the most able man for the job and Wolsey was the product of Henry VII's system. Wolsey's rise to power was also aided by the kings annoyance at his councillors left from his father's reign who pressured him to maintain the same policies and who actively discouraged him from going to war. During the next years he supplicated for the degrees of B. D. and D. D., and obtained the additional livings of St. Bride's, Fleet Street, London, and Torrington in Devonshire, as well as a prebend in Hereford cathedral. On 17 Feb 1511, he became a canon of Windsor and soon after registrar to the Order of the Garter. By 1512 he was exercising marked influence in political affairs and his share in the royal favour was already attracting the dislike of the old nobility. In foreign and domestic business alike the King followed his counsel and daily entrusted more power to his hands. Fresh preferment continued to pour in on him. He became successively dean of Hereford (1512), dean of York (1513), dean of St. Stephen's, Westminster, and precentor of London. He began to keep some state and when he accompanied the King to France in Jun 1513, he was followed by a train of two hundred gentlemen. Henry's plan to gain this European respect was simple: a successful military strike against France. After one failure, he went in person to achieve glory in Aug 1513 at the Battle of the Spurs. Just a month later, the English defeated the Scots at Flodden Field; Henry's brother-in-law James IV was killed. Of course, the English couldn't sustain a permanent presence in France so they decided on to make peace. Henry's youngest sister Mary was the sacrificial lamb; just eighteen, she was married to the sixty-year-old Louis XII of France. The bridegroom survived just three months of marriage and Mary angered her brother by secretly following her heart and marrying Henry's best friend Charles Brandon just weeks after Louis XII's death. Wolsey was present through Henry's successful campaign, and at the King's request the Pope named him Bishop of Tournay; but he never obtained possession and later on surrendered his claim to the bishopric for an annual pension. Instead he was appointed Bishop of Lincoln, the papal bulls being dated 6 Feb 1514, and he was consecrated at Lambeth palace on 26 Mar. In the following Sep he succeeded Cardinal Bainbridge as Archbishop of York, and on 10 Sep 1515, was created Cardinal with the title "S. Caecilia trans Tiberim", receiving the hat in Westminster Abbey on 18 Nov. A month later (24 Dec) he became Lord Chancellor of England, and had thus attainted at the early age of forty or there-abouts the highest dignities, spiritual and temporal, that a subject could hope for. His power with the King was so great that the Venetian Ambassador said he now might be called "Ipse rex" (the King himself). Wolsey was also careful to never offend or anger Henry. It was a careful dance and a tribute to his own intelligence that he succeeded in managing this most unmanageable King. Wolsey appealed to Henry's vanity by crediting all success to the King and all failures to his own inadequacies. Henry did not request daily information about Wolsey's doings like his father had done of Empson and Dudley and in Eltons view 'the King was often in a state of ignorance' but this maybe shows a difference in character rather than blind trust. Henry VIII thought himself, at least at the beginning of his reign so strong and powerful that nobody would dare to disregard his wishes. After 1516 a new group of younger friends gathered around Henry, "the mignons": Sir Francis Bryan, William Carew, Henry Norreys, William Coffin, William Carey; who, in emulation of the French court, became known as the Gentlemen of the Privy Chamber. Wolsey dispersed these "mignons" on a series of military and diplomatic missions to prevent their attempts to poison Henry against him. In 1513 both Knyvett and Edward Howard were killed in military service. In 1519 he expelled the mignons to Calais for unbecoming conduct at court. William Compton’s control of the Privy Purse was restricted as was the mignons’ intervention in administering the King’s Wards. His own appointees, Sir Richard Wingfeld, Sir Richard Weston, Sir Richard Jerningham and Sir William Kingston were placed close to the King as Bedchamber Knights of the Body. In 1523 Compton was sent on service to Scotland. He used the Eltham Ordinances in 1526 (supposedly to reform and improve the royal household) to influence appointments to Henry’s closest circle. The number of gentlemen was cut from 12 to 6, among the victims were Wolsey’s key enemies, Compton, Carew and Boleyn. He was able to get the dukes of Norfolk and Suffolk to co-operate with him because his competence in government could not be denied. He was also helped by the jealousy and faction that divided his noble opponents; Buckingham, Norfolk and Suffolk had very little time for the mignons. Of Wolsey's foreign policy only the main lines can be indicated. His first efforts were to lead the King back to his father's policy of an alliance with France in opposition to Fernando of Spain and the Emperor Maximilian. But the French conquest of Milan at the battle of Marignano in 1515 checked this scheme, and led Wolsey to make new treaties with Maximilian and Fernando. After Fernando's death the Cardinal's policy entered on a new phase, calculated to meet the entirely new situation. Fernando's successor, Carlos V, now held Spain, the Indies, Sicily, Naples, and the Netherlands with reversion of the duchy of Austria. Rivalry between the two young monarchs, Francois and Carlos, thus became inevitable, and Wolsey saw the advantage which England would derive from the sense each had of the value of the English alliance. At this time the Pope was endeavouring to raise a crusade against the Turks, and Wolsey adroitly succeeded in effecting a universal peace to which the Pope and Emperor as well as Francois and Carlos were parties. Under cover of this peace Wolsey pushed forward his favourite policy of alliance with France. A treaty with France was carried through by the Cardinal himself and the other councillors were only called to approve what had already been settled. But in Jan 1519, the situation was again changed by the death of the Emperor Maximilian and the consequent contest for the imperial crown. When Carlos was duly elected Emperor the rivalry between the houses of Habsburg and Valois was accentuated. Instead of three powers -Maximilian, Francois, and Carlos- Wolsey had now only two to reckon with and to play off against each other. He determined on a policy of neutrality with the view of giving England the decisive power in guiding the destinies of Europe. Meetings between Henry and both the rival monarchs took place; he met Carlos at Canterbury and Francois at the celebrated Field of the Cloth of Gold. But a second meeting with the Emperor followed immediately and Henry's personal predilections were in favour of an alliance with him rather than with France. Still Wolsey persuaded the King that the neutral policy was the most profitable, especially when war actually broke out. Both parties to the war were soon willing to accept England's mediation, and Wolsey conducted a long conference during which his conduct was more diplomatic than honest, and before the conference was over he signed a secret treaty with the Emperor which provided for an offensive and defensive alliance against France. This was a new policy for him to adopt, and it is clear that in this treaty his own wishes were overborne by Henry's desire for a new war with France, and it was not till two abortive campaigns had disillusioned the King that Wolsey was again able to resort to diplomatic measures. This treaty with the Emperor was, however, of importance in Wolsey's own life as it opened up the way for his possible election to the papacy. The death of Leo X (2 Dec 1521) gave the Emperor an opportunity of exercising his influence in Wolsey's favour as he had promised, but the imperial influence was not in fact brought to bear and Wolsey received very few votes. During the year 1522 the alliance with the Emperor continued, and Wolsey was occupied in raising large sums of money for the proposed war against France, becoming thereby still more unpopular with the nation. 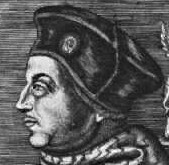 The new Pope, Adrian VI, died on 14 Sep 1523, and again Wolsey was a candidate for the papacy. The English Ambassadors at Rome were confident that the united influence of Carlos and Henry would secure his election, but again Carlos deceived him and Clement VII was chosen. The new Pope not only confirmed his legateship for life, but gave him the Bishopric of Durham in addition to his Archbishopric of York. Upon this Wolsey resigned the See of Bath and Wells which he had held in commendam since 1518. It does not seem that Wolsey personally was particularly anxious to become Pope, though doubtless he would have accepted the position had he been chosen. On the election of Pope Clement he wrote, "For my part, as I take God to record, I am more joyous thereof than if it had fortuned upon my person", and Anglian historians, such as Bishop Creighton and Dr. James Gairdner, accept this as representing his genuine feelings. The alliance with the Emperor, which had always been against Wolsey's better judgment, did not survive the events of 1523. Henry could not make war again for want of means, and Carlos now distrusted him; so Wolsey reverted to his original idea of alliance with France, but he was not able to do much until 1525, when the defeat and capture of Francois at the battle of Pavia made the dominant power of Carlos a danger to all Europe. In face of this peril Henry reluctantly made a new treaty with France. It was a bold policy for Wolsey, for, having incurred the jealousy of the nobility by his power, he had aroused the hostility of the people by financial exactions, and he provoked the enmity of all by the extravagant pomp with which he surrounded himself on all his public appearances. The costly splendor of his palaces, his gold and silver plate, and his New Year's gifts outshone those of kings. His servants knelt to wait on him. Bishops tied his shoe-latchets. Dukes held the basin while he washed his hands. Ambassadors might consider themselves honored in being permitted to kiss his hand but might not presume to discuss new business with the King before broaching it to Wolsey. 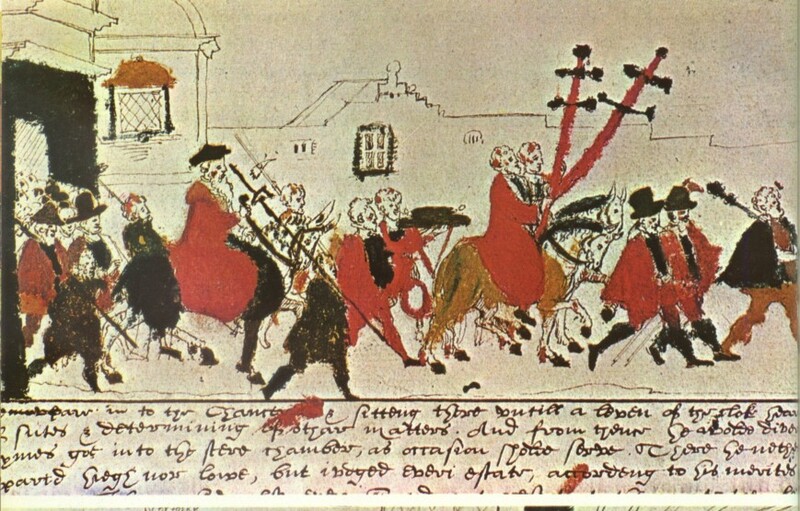 Illustration of George Cavendish´s biography of Wolsey, showing the Cardinal pomp: Wolsey riding in procession preceded by his great crosses, as Archbishop and legate; and his Cardinal hat. Wolsey ruthlessly swept away feudal jurisdictions. He initiated the policy of destroying the monasteries, which was to be carried through to completion by Henry VIII. Some of the confiscated property he applied to the foundation of Christ Church College at Oxford. But Wolsey's greed, arrogance, and insatiable lust for power outweighed his many great qualities, and the sumptuous edifice to his grandeur was built on sand. His more than regal state was sustained not by the revenues of his many offices alone but also by enormous pensions from foreign sovereigns, bribes from English applicants for justice, and the misappropriated revenues of the suppressed religious foundations. 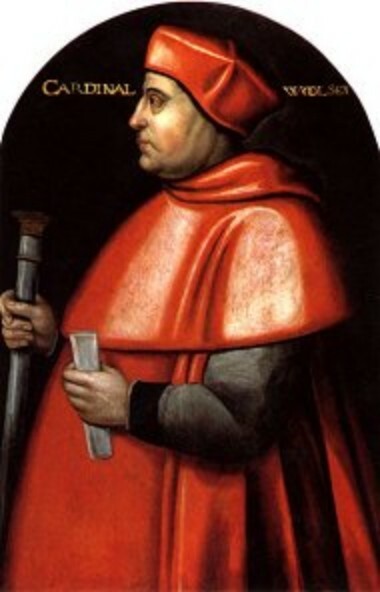 Wolsey had quickly established himself as second only to Henry in power. This naturally angered the old nobility who made up the privy council and dominated Parliament. They were indignant that Wolsey, son of a butcher, controlled access to the King. They were also angry that Wolsey refused to treat them as they deserved - simply put, they were nobility and he, despite the honors the King heaped upon him, was a commoner. In the natural order, he was their inferior. His refusal to act inferior was galling to them, particularly the powerful dukes of Norfolk and Suffolk. Certainly Henry was even more proud that his nobles. That begs the question - was he ever insulted by Wolsey's supposedly overbearing arrogance? No; in fact, Henry displayed his typical cunning by selecting his advisor based on both ability and indebtedness. Wolsey was his creation - his to reward or, as he did eventually, destroy. He could rely only on the King's favour, and he knew that to lose this was complete ruin. Just at this critical juncture the King raised the question of the divorce from Queen Catalina in order that he might marry Anne Boleyn. This personal matter "widened into unexpected issues and consumed Wolsey's energies till it led to his fall" (Creighton, p. 150). Wolsey did not wish Henry to marry Anne, but he was not averse to ridding himself of Catalina's adverse political influence, for her sympathy with her nephew the Emperor caused her to dislike Wolsey's French policy. So he lent himself to forward the King's wishes. The first steps were taken in his own legatine court, apparently with the idea that if this tribunal pronounced against the validity of Henry's marriage the Pope would confirm the sentence. But Catalina learned of the King's plan and prepared to defend her rights. As she could count on the sympathy of both Pope and Emperor the King despatched Wolsey to persuade the French King to bring sufficient pressure to bear on the Pope to counteract the influence of Carlos. The scheme was to deliver the Pope from Carlos V, who had sacked Rome, in the hope that Clement's gratitude would induce him to favour the King with regard to the divorce. The history of the divorce question has been treated of under the articles Clement VII and Henry VIII; it will suffice here to note Wolsey's attitude. When he returned to England he heard for the first time of Knight's embassy to Rome, and thus learnt that he no longer enjoyed the King's complete confidence. And though Anne Boleyn and the King, realizing that he might yet be useful, treated him with friendliness and consideration, he realized that in Anne he had a serious political rival. When the Pope appointed Cardinal Campeggio to try the case in England with Wolsey, the English Cardinal soon learnt that the matter was entirely in his colleague's hands. All Campeggio's efforts to avoid holding the trial at all having failed, the court sat at Blackfriars on 18 Jun, 1529. BEF this Anne Boleyn, regarding Wolsey as responsible for the long delay, had set herself to bring about his fall. The failure of the trial rendered this possible, and during Aug and Sep he was kept at a distance from the Court and was known to be in disgrace. The Pope had no choice but to obey Carlos's wishes though he struggled to appease Henry as much as possible. He suggested that Henry's illegitimate son, Henry Fitzroy, Duke of Richmond, should wed Catalina and Henry's daughter Mary. He told Henry to take Anne Boleyn as his mistress and promised to legitimize their children. The Pope even suggested bigamy (send Catalina to a nunnery and marry Anne). But Henry wanted no doubt of the legitimacy of his second marriage and its hoped-for offspring. From 1527 to 1529, he was content to let Wolsey try the usual diplomatic and military solutions but these were unsuccessful. After all, England did not have the military might to force Carlos from Italy and free the Pope to make an independent decision. Had he been free of Carlos, the Pope would undoubtedly have ruled in Henry's favor; it had been done before for monarchs throughout Europe. In fact, though the term 'divorce' is most often used in this case, Henry wasn't actually seeking a divorce. He was actually seeking an annulment - he argued that he had never been legally married to Catalina. But as Wolsey, near sixty-five, failed to secure an acceptable solution, Henry became impatient. He was now all too willing to listen to his outraged nobles; having suffered with Wolsey for so long, they used their King's impatience to secure his destruction. It was suddenly remembered that Wolsey's office of papal legate was in direct violation of the ancient Statute of Praemunire which outlawed direct papal jurisdiction. Of course, Henry had sanctioned Wolsey's legatine authority and so had broken the law himself. This did not matter. Wolsey was no longer useful to his increasingly ruthless master and on 9 Oct 1529, he was deprived of everything but the archbishopric of York. In Nov a bill of indictment was preferred against him, and on 19 Nov he had to surrender the great seal of England. On 22 Nov he was forced to sign a deed confessing that he had incurred a praemunire and surrendering all his vast possessions to the King. On 30 Nov judgment was given that he should be out of the King's possession and should forfeit all his lands and goods. He remained at Esher through the winter, disgraced, though not without occasional messages of kindness from the King. His health, which had been bad for many years, now failed seriously. In Feb he received a general pardon, and the possessions of his archbishopric were restored to him, except York House, which he had to convey to the King. He was then allowed to retire to York, where he spent the last six months of his life in devotion and a sincere effort to do his duty as a Bishop. He left London for York in Apr 1530. Though he had been worldly and his private life had not been stainless, he had always been a Catholic. His last days were embittered by the news that the King intended to suppress the two colleges, at Ipswich and Oxford, which he had founded with such care. The former perished, but Christ's College survived, though not in the completeness he had intended. He died unregretted by any save his immediate attendants, yet he had given his life unselfishly to the interests of his country, and no Englishman has ever surpassed him in the genius with which he directed both the foreign and domestic relations of England, so as to make each undertaking help his great design of making her the centre of European politics. His foreign policy, though planned on great and heroic lines, was severely practical. Its object was to help English trade and to maintain peace, to secure union with Scotland, and to effect judicious ecclesiastical reforms. He looked for a European settlement of the difficulties that beset the Church and desired England to take the leading part therein. His failure was owing to the selfishness of Henry. The question of the divorce not only led to the fall of Wolsey, but withdrew England for generations from European politics and made her, not the leader that Wolsey had dreamed of, but a nation apart. 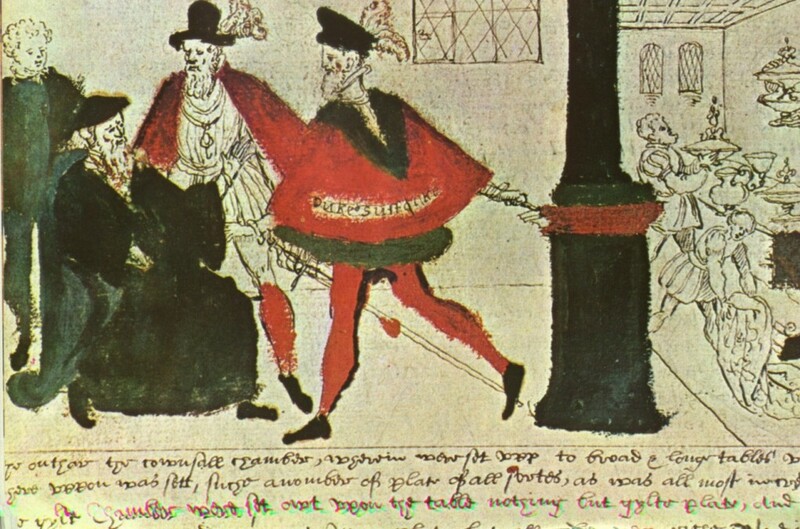 When Wolsey's gentleman usher, George Cavendish, who had been at Wolsey's deathbed at Leicester, travelled to London to tell the King how the Cardinal had died, he found Henry shooting at the butts in the park at Hampton Court. Henry told Cavendish to wait until he had finished shooting, and then changed into his nightgown, and taking Cavendish into the palace through a private door, spoke with him alone about Wolsey's last hours. Of the contemporary accounts of Wolsey, Polydore Vergil (who had been imprisoned by the Cardinal) in his Anglica Historia and Hall in his Chronicle are equally prejudiced and hostile. So too are the rhymes of Skelton. Opposed to these is Cavendish, Life of Wolsey, which gives a vivid and touching personal account abounding in intimate touches (latest reprint, London, 1887). All the volumes of State Papers from 1509 to 1530 are of importance and their publication in recent years has superseded all the earlier lives of Wolsey. The results of the careful study of these documents may be obtained in Brewer, Reign of Henry VIII (London, 1884) and, in briefer form, in Creighton, Cardinal Wolsey (London, 1888). A Catholic view is represented by Taunton, Thomas Wolsey, Legate and Reformer (London, 1901). See also Gairdner in Dict. Nat. Biog., s.v. According to the Dictionary of National Biography Wolsey had a mistress, the sister of John Wynter, Keeper of the King's Storehouse who died in 1554 but she may have been the daughter of another John Wynter of Cardington in Bedfordshire, the second wife of Sir William Gascoigne, Comptroller of Wolsey's Household. There is a brass at Cardington, Bedfordshire to William Gascoigne and his two wives. His second wife was Elizabeth, daughter of John Wynter (Vinter) of Cardington whose arms were "ermine, a bull passant sable" (Wyther or Wynter). Other sources name his mistress as Joan, perhaps the daughter of Peter Larke, an inn-keeper of Thetford. His son Thomas Larke (d. Jul 1530) became Wolsey's confessor and the King's chaplain. He was given a canonry of St. Stephen's on 10 Nov 1511 and became Master of Trinity Hall, Cambridge in 1520-5. The living of Winwick was held on 21 Jun 1515 by Thomas Larke, Wolsey's chaplain, followed by Wolsey's son, Thomas Wynter in 1525, who was presented to it by the King, after which it went to Thomas Boleyn and Thomas Stanley. It was then restored to Thomas Larke in 1529, followed by William Boleyn and Thomas Wynter. Wolsey's chaplain may have had some connection with Thomas Larke, vinteyner or captain of a troop of 20 soldiers and Lord Lisle's secretary. Larke, John and Leonard Smyth and William Gonson, Clerk of the King's Ships were residents of Calais in 1539 when Wolsey was chaplain there under the Commander of Calais, Admiral Arthur Plantagenet. Peter Larke's other sons were William Larke, a draper and Peter, employed by John Kite, Archbishop of Armagh (Wolsey's friend) and afterwards by Stephen Gardiner, Bishop of Winchester (Wolsey's protégé and secretary) . Joan Larke or Wynter, later wife of George Legh or Lee of Adlington, Cheshire, lived in a manor house by the Thames near Thames Ditton and Hampton which was later turned into the Swan Inn where Wolsey carved his initials on the mantlepiece of the fireplace. Wolsey had a son by Joan Larke called Thomas Wynter and a daughter Dorothy Wynter (b. Michaelmas 1512). Why Wolsey gave his children the surname Wynter is a mystery unless it was because Thomas Larke was a vintener or captain of 20 men. Thomas was called Wolsey's nephew, usually an euphemism for an illegitimate son but if he was actually the Cardinal's nephew son, this may mean Wolsey's sister married a Wynter. Perhaps Joan married a Larke, was the Cardinal's sister and had a son by a Wynter. The Cardinal gave her a dowry when she married George Legh or Lee of Adlington, Cheshire. His dau. Dorothy was adopted by John Clansey and later became a nun at Shaftesbury. She received a pension after the Dissolution of Shaftesbury Abbey in 1540 and died there in about 1553. Thomas Wynter may have held the manor of Saunderton in Buckinghamshire as a tenant at the Dissolution of the Abbeys in 1537. A poor kinswoman of Wolsey's married his servant John Oxenherd, a seaman who carried the Cardinal's goods by sea to the north in Apr 1530. She was threatened with eviction by Thomas More and his son-in-law Daunce.